Columbia University educational historian Susan Fuhrman discusses the constituting societal factors that spawned the standards movement. Standards-based reforms are reforms intended to anchor key aspects of policy—curriculum, assessment, teacher education, and professional development—around policy level statements of what students should know and be able to do. 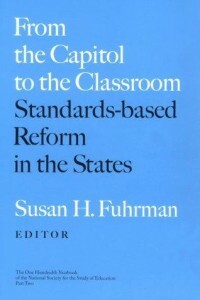 The idea was that states (although sometimes this happens at the district level, and some have argued for official, national standard setting) would develop content and performance expectations that would set direction for student achievement and for other policies aimed at increasing student performance. Third, research was showing that greater academic coursetaking, a result of the Excellence reforms, did not necessarily lead to greater learning because reliance on a single policy lever—course requirements—did nothing to assure that the content of the courses was improved or that teachers were well prepared to teach that specific content. … It seemed that more course requirements alone would not be sufficient, but that a much more comprehensive and coherent approach, using multiple policy levers of course requirements, curricula, teacher training, and assessment would be needed to improve student learning. This was a central part of the theory of standards-based reform: uniting previously diverse key instructional guidance mechanisms around common instructional goals. Finally, the standards reforms offered the hope of more equitable instructional opportunities for all children. It was envisioned that standards would embody content and performance expectations for all children, and that by tying assessment to the standards, states and districts could monitor whether all schools were striving to achieve them. No longer would groups of students be written off and offered less challenging curricula; instead, all students would be offered more ambitious curricula pegged to standards. No longer would student assessment tap only low level skills and therefore have salience only for lower-performing students; instead, assessments would be aligned to challenging standards and cause all students to strive to learn the same content. The concept that challenging standards for all students would lead to better instructional experiences for all students was another central component of the theory of action underlying standards reforms.